I want you to meet some brave Christian leaders pledging their lives, their fortunes, and their sacred honor. When thinking of the golden age of the Church, many of us hearken back to the book of Acts, when Peter and John stood up to the religious authorities, who told them to be silent about Jesus the risen Messiah. “Whether it is right in the sight of God to listen to you rather than to God,” they answered, “you must judge, for we cannot but speak of what we have seen and heard.” Then they prayed for boldness, and the Church exploded across much of the ancient world. But there’s a golden age for the church going on right now—with the same kind of courage, persecution, and Spirit-empowered growth. Where is it? In communist China. World missions historians tell us that when all the foreign missionaries were kicked out of Mao’s China a few years after the Second World War, there were probably no more than 3 million believers in Jesus Christ in the whole, vast nation. But today, seven decades later, the Pew Forum on Religion and Public Life counts 67 million Christians of all kinds—35 million independent Protestants, 23 million Protestants in government-sanctioned churches, and 9 million Catholics. Other estimates go even higher. Whatever the true number is, it’s almost as many as there are members of the Communist Party! Maybe that’s why the government is cracking down on Christians. According to Christianity Today and other news outlets, Under President Xi Jinping, China’s government has been tightening its grip on religious affairs. In February, regulations aimed at religious groups have brought increased pressure on churches to be “Chinese” culturally and to submit to the authority of the Communist Party. 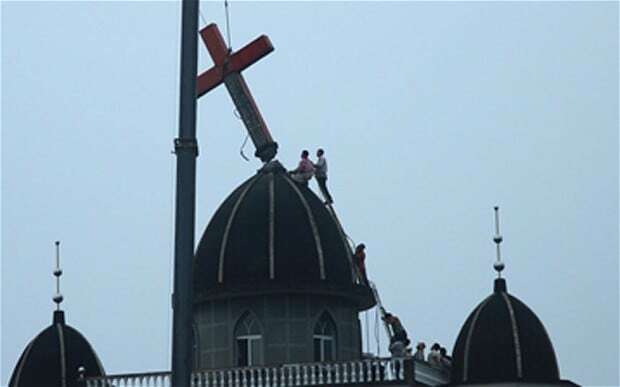 Churches are being told to burn their crosses and replace them with Chinese flags and to display slogans praising the Communist Party. Some are being forced to join the government-sanctioned churches and permit video surveillance of their services. In the spirit of Peter and John, a group of at least 250 Chinese pastors has publicly signed a joint statement opposing the new regulations. In the statement they declare that Jesus is Lord of all, offering eternal life to anyone who will repent and believe in Him. Friends, is it any wonder that the church in China has grown, and continues to grow? What we’re seeing before our eyes is the golden age of the church in China. How can we not pray for these wonderful brothers and sisters? And more than that, how can we not emulate their costly faithfulness in our own little corner of God’s world? I Thessalonians 2:4 — On the contrary, we speak as those approved by God to be entrusted with the gospel. We are not trying to please people but God, who tests our hearts. Whene’er we hear that glorious word.